Every good company strives to better themselves with experience. Consequently accolades given by outside organizations help boost staff morale and make us proud to be part of an award winning team. They give our team a chance to look back on the experiences we’ve shared together and help us look toward the future. 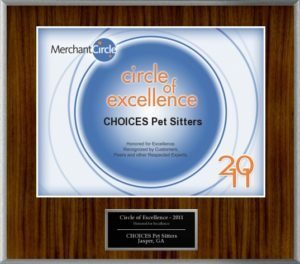 These 3rd party awards also help the consumer know that the company is working toward offering a more value added service, gives us credibility, and shows our dedication to the pet sitting profession. 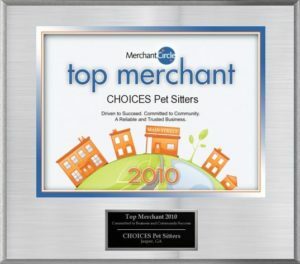 Choices Pet Sitters won the Merchant Circle’s Top Merchant Award for 2010. 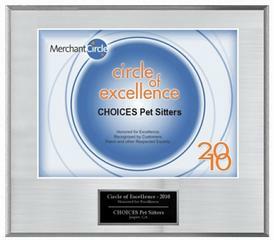 In addition, our company won the Circle of Excellence Award in 2010…. … and we also won it again 2011 as well!